Turquoise kaleidoscope nail art | Light Your Nails! Today I am showing you the stamping I did over Femme Fatale Gentlemen’s Scuffle. I used once again Kaleidoscope BPX-L021 stamping plate and Bornpretty special stamping polish in light blue (no.9). I love this plate. I purchased it for the patterns on the right side but I keep using the ones on the left, too. I am so in love with this nail art myself. I wore it until my nails were too chipped to go out haha. I would recreate it anyday though. I love every single detail, from the colours to the pattern. I shouldn’t say that myself though so you tell me, do you like this stamping attempt as much as I do? I hope so! Anche secondo me ha un che di arabeggiante! Grazie! Anche io me ne sono innamorata! Such a cool stamping image! 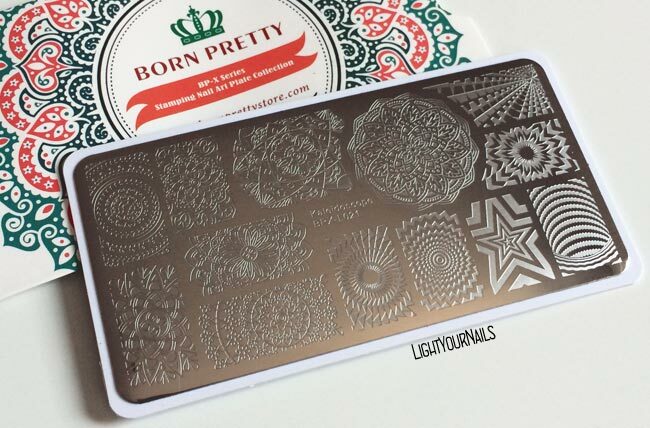 Your stamping is so neat and perfect! They are really good! I have the first ones but not the newest yet. This is one beautiful combination! And the stamping is so neat, placed perfectly in the middle like that, I always have trouble with that! Thanks Heaven for clear stampers! Perfect color combo! Great plate! This motif and colours look so well together. Great stamping.